A small European spacecraft, known as the Mobile Asteroid Surface Scout (MASCOT), successfully landed on asteroid Ryugu on Wednesday, Oct. 3, starting its short but busy operational life. 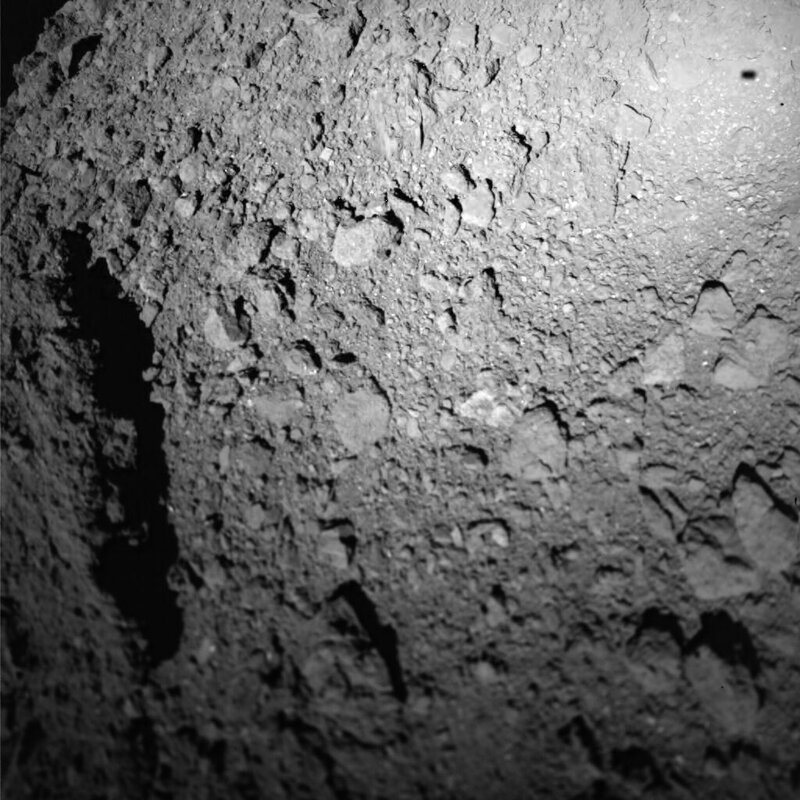 MASCOT was deployed by Japan’s Hayabusa 2 spacecraft, which has orbited Ryugu since late-June 2018. The cube-shaped lander separated from the orbiter at 1:58 GMT (9:58 p.m. EDT on October 2) at an altitude of about 167 feet (51 meters) and descended in a free fall. The landing occurred some 20 minutes later. “From the lander’s telemetry, we were able to see that it separated from the mothercraft, and made contact with the asteroid surface approximately 20 minutes later,” said Tra-Mi Ho, MASCOT project manager at German Aerospace Center’s (DLR) Institute of Space Systems. DLR’s MASCAM camera on board MASCOT acquired this image as it descended to the asteroid Ryugu three and a half minutes after separating from its mothercraft Hayabusa 2. In the image, the lander is approximately 20 meters above the asteroid’s surface, and MASCOT’s shadow can be seen at the top right. Image Credit: MASCOT/DLR/JAXA. During the descent, the spacecraft made use of its MASCAM camera and took 20 pictures, which are now stored onboard Hayabusa 2. After landing, the spacecraft almost immediately started exploring the surface of the asteroid, conducting various measurements. The probe is designed to investigate the structure and mineralogical composition as well as the thermal behavior and magnetic properties of Ryugu. The asteroid has been identified as one that is potentially hazardous (it could strike Earth). It has a diameter of around 0.6 miles (1 kilometer). When MASCOT completes measurements in one location it is capable of tumbling to reposition itself in order to conduct further studies. However, given that the lander is fitted with a non-rechargeable battery, it is capable of operating on Ryugu for only 16 hours. Although MASCOT’s operational life is short, scientists hope for intensive work resulting in collecting crucial data for improving our understanding of the formation and evolution of the Solar System. “With MASCOT, we have the unique opportunity to study the Solar System’s most primordial material directly on an asteroid,” said Ralf Jaumann, planetary researcher at DLR. Developed by DLR in cooperation with the French space agency CNES, MASCOT weighs some 21 lbs. (9.6 kilograms) and measures 11.6 x 10.8 x 7.7 inch (29.5 x 27.5 x 19.5 centimeters). Besides MASCAM, the lander is equipped with an infrared spectrometer (MicrOmega), a magnetometer (MASMAG), and a radiometer (MARA). MASCOT is the third probe sent to Ryugu’s surface by Hayabusa 2. On Sept. 21, the orbiter deployed two tiny rovers, designated Rover-1A and Rover-1B, as part of the second MIcro Nano Experimental Robot Vehicle for Asteroid (MINERVA-II) project. It marked the first time when rovers capable of maneuvering around the surface of a body, have been successfully placed on an asteroid. Another spacecraft, Rover-2, is planned to be deployed by Hayabusa 2 in 2019. Weighing some 0.6 metric tons, the Hayabusa 2 spacecraft was launched on December 3, 2014 by the Japan Aerospace Exploration Agency (JAXA) on a mission to explore Ryugu, retrieve materials from it and bring them to Earth. It arrived at the asteroid on June 27, 2018 and is scheduled to depart from the tiny world in December of next year (2019) in order to return home the following year. How does this asteroid have any gravity? If it does do all asteroids have gravity no matter what size?